In this Sunday, Jan. 1, 2017, file photo, New York Jets cornerback Darrelle Revis walks on the field after a game against the Buffalo Bills in East Rutherford, N.J.
New York Jets cornerback Darrelle Revis faces five pending charges, including two counts of aggravated assault, after allegedly being involved in a fight with two men last weekend. 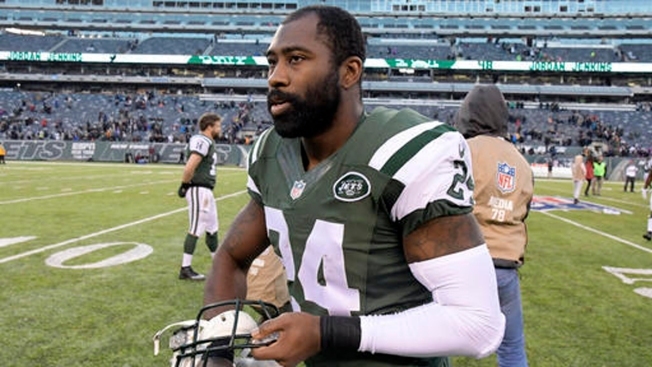 According to a Pittsburgh police statement and a court document, the 31-year-old Revis also is facing charges of robbery, terroristic threats, conspiracy to commit aggravated assault after the incident Sunday at 2:43 a.m.
Revis' attorney, Blaine Jones, said in a statement Thursday that Revis was "physically assaulted while at that location by a group of at least five people." He adds that the Jets cornerback "feared for his safety" and sought medical attention. Jones told The Associated Press once a warrant is issued, he will arrange for Revis to turn himself in. Police say the alleged fight started when a 22-year-old man from Kittanning, Pennsylvania, not identified in the statement, spotted Revis walking along East Carson St. After Revis confirmed he was the NFL player, the man started recording the interaction. Revis grabbed the phone and tried to delete the video. Another 21-year-old man from Ross Township tried to help the other man, but Revis tossed the phone into the road, the statement says.